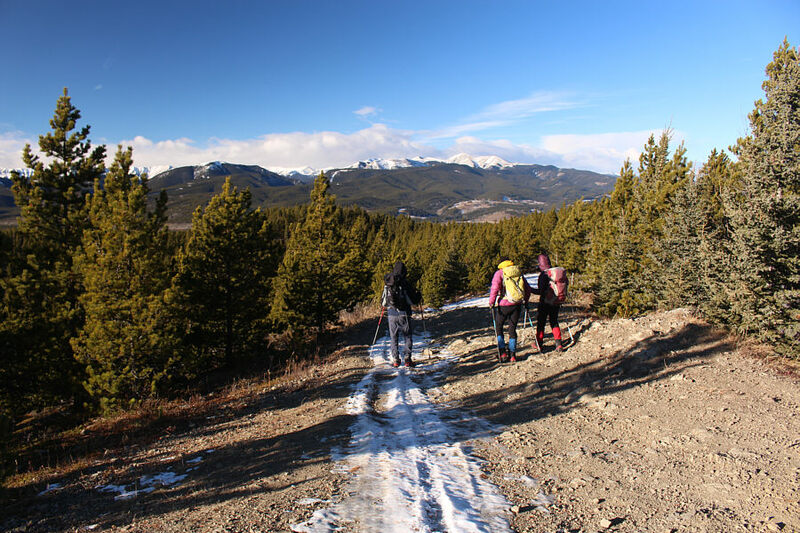 With other commitments both in and out of town later in the day on 2 December 2017, Marta Wojnarowska, Zosia Zgolak and I chose a short hiking objective in McLean Hill which is located in the Elbow River valley of Kananaskis Country. 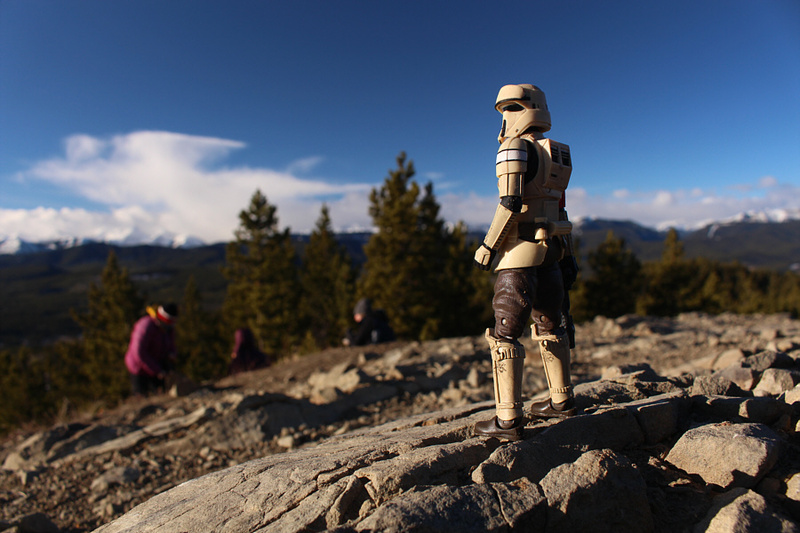 Joining us on this hike was Kevin Caron. 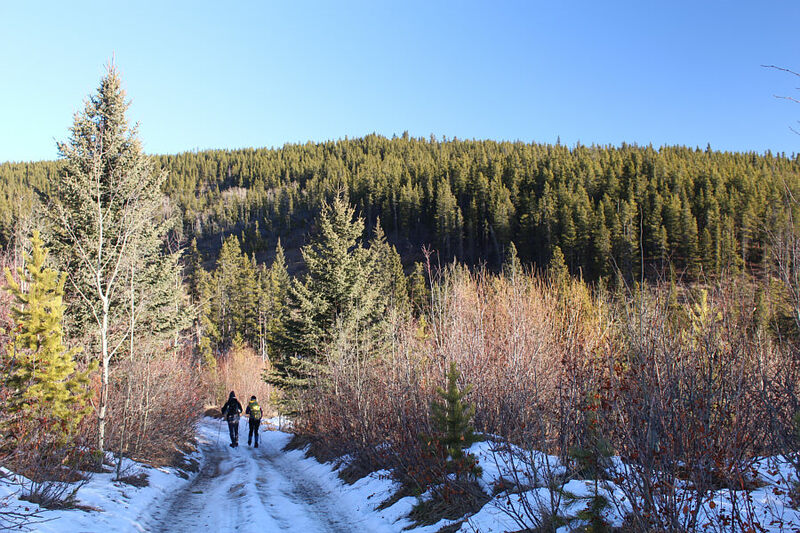 As described in Gillean Daffern's Kananaskis Country Trail Guide, McLean Hill abounds with numerous trails, exploration roads and cut lines which offer a variety of ways to get up and get down and maybe even get lost! 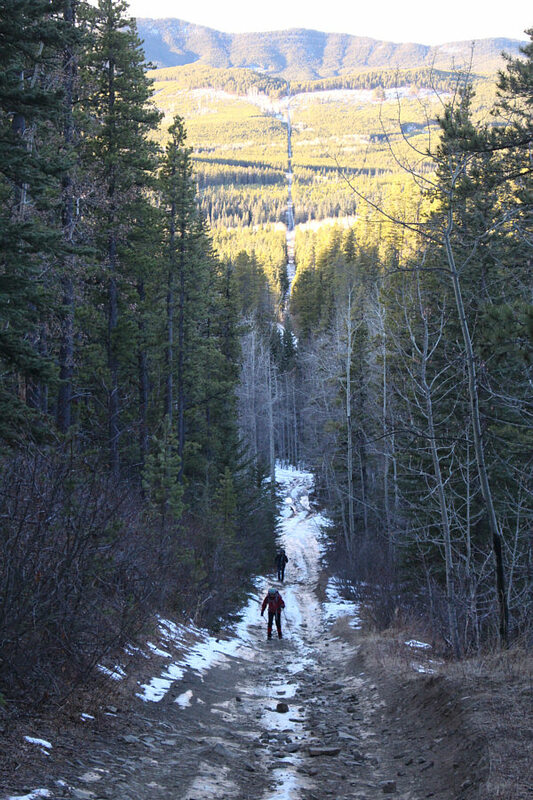 We started our hike from the winter gate on McLean Creek road. 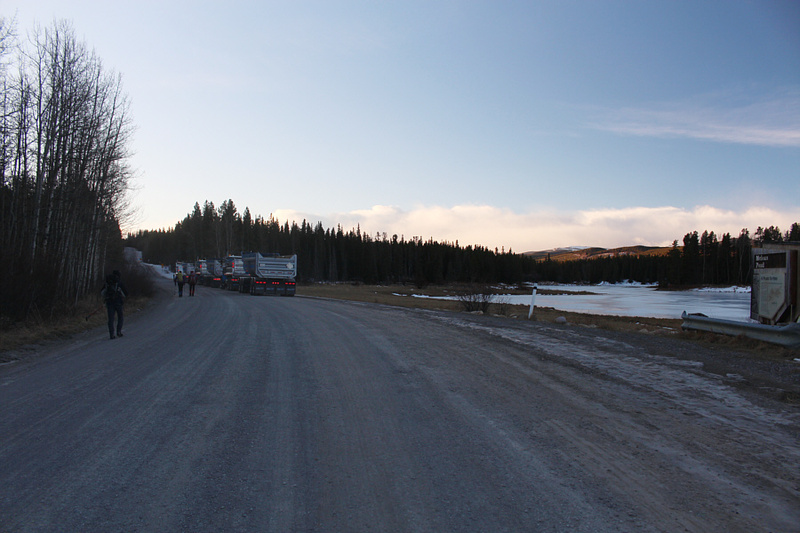 Although the road was officially closed for the season, a convoy of dump trucks rolled past us as we walked southward. 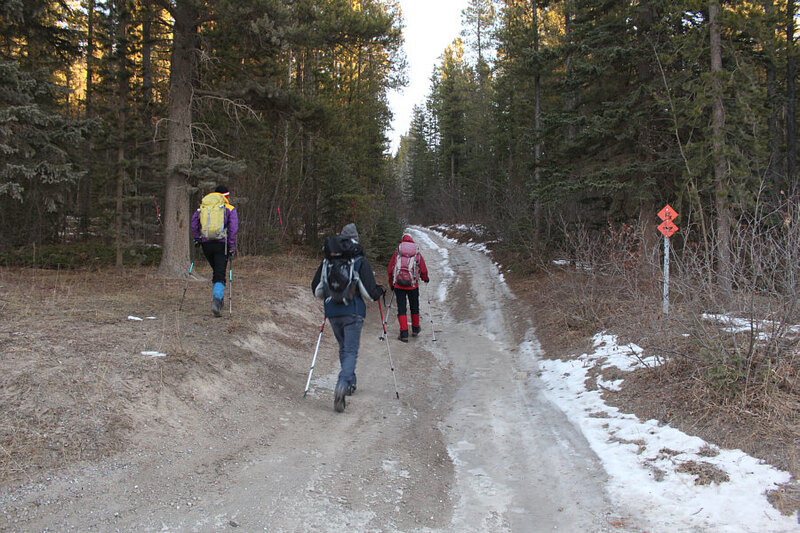 After walking along the road for about 2.5 kilometres, we turned east onto an exploration road which is part of an obvious cut line also known as Priddis Creek trail. The exploration road was very icy on this day, and we had to take extra care to avoid any painful slips. About two-thirds of the way up, we left the road and made a beeline for the summit thinking that it would be an easy off-trail hike. Unfortunately, we ran into some rather unpleasant bushwhacking which had me wondering why we left the road in the first place. Thankfully, the bushwhacking was short-lived, and we eventually regained the road not far from the panoramic summit. 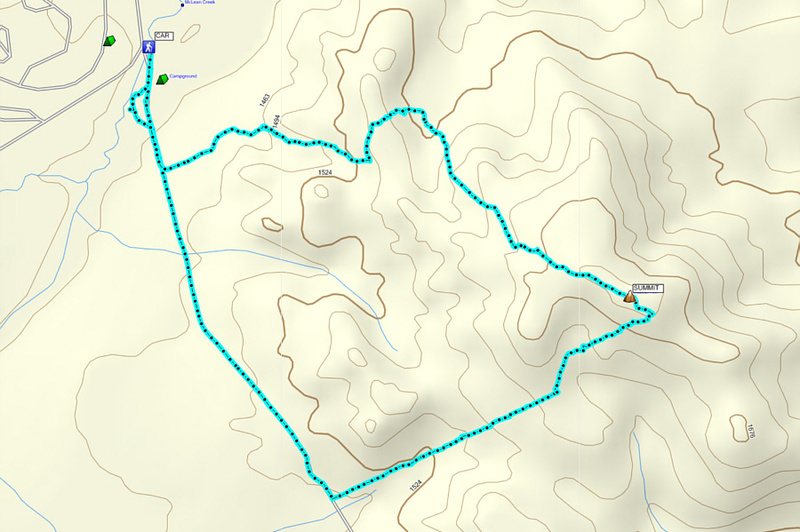 For our descent, we dropped down the northwest side of McLean Hill on a good trail, but we ultimately abandoned it to hike over a somewhat annoying intervening ridge. 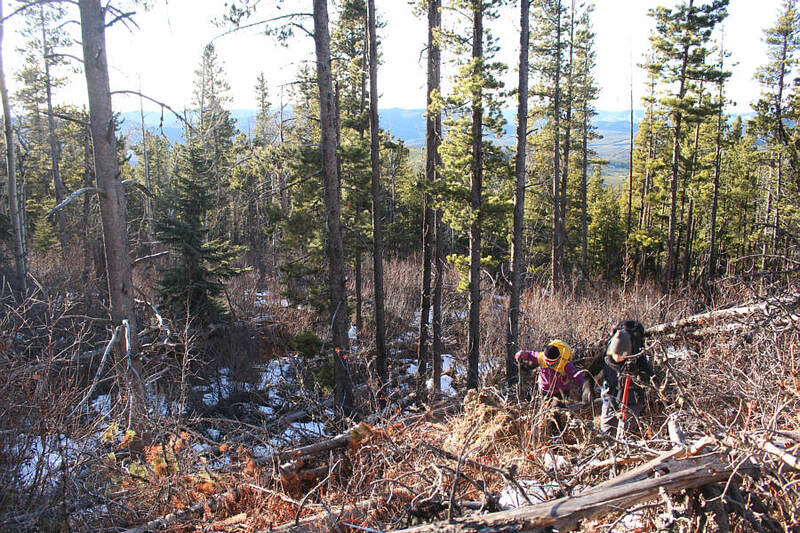 The bush was not as bad here, and once we crested the ridge, we easily hiked down the other side to McLean Creek road. We subsequently made a short detour to check out frozen McLean Pond before returning to our starting point at the winter gate. 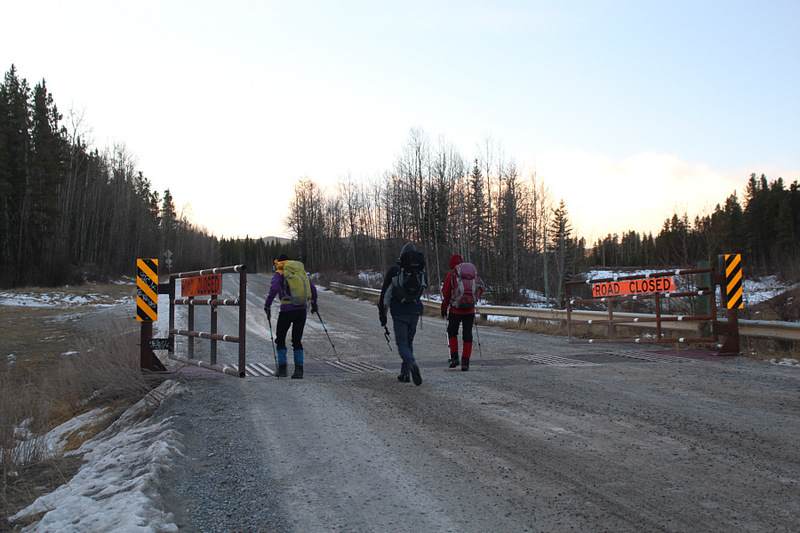 The group walks past the winter gate on McLean Creek Road. Several dump trucks pause on the road beside McLean Pond. The group leaves McLean Creek Road and turns up this rougher exploration road. The exploration road is actually part of a long cut line. The road drops down a bit here before resuming its climb up McLean Hill. 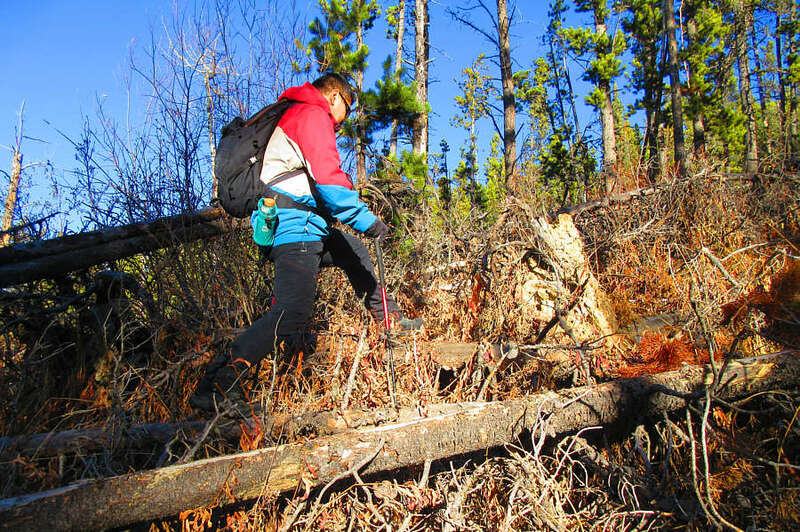 After leaving the exploration road, Sonny relives some of the nasty bushwhacking he previously endured at North Kintla Creek. Marta and Kevin fight their way up the bushy slope. 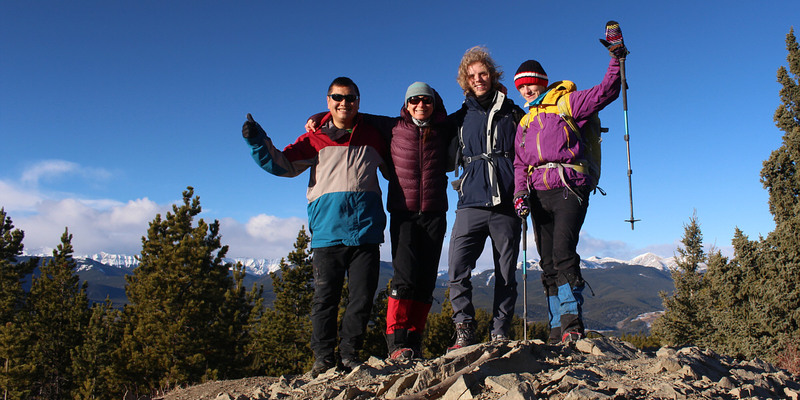 Sonny, Zosia, Kevin and Marta arrive on the summit of McLean Hill (1721 metres). 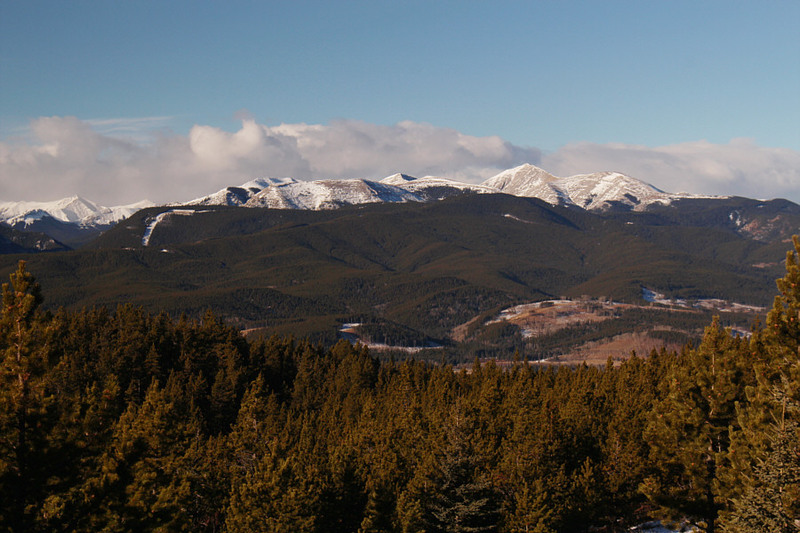 The familiar forms of Banded Peak, Outlaw Peak, Mount Cornwall and Mount Glasgow are visible to the southwest. 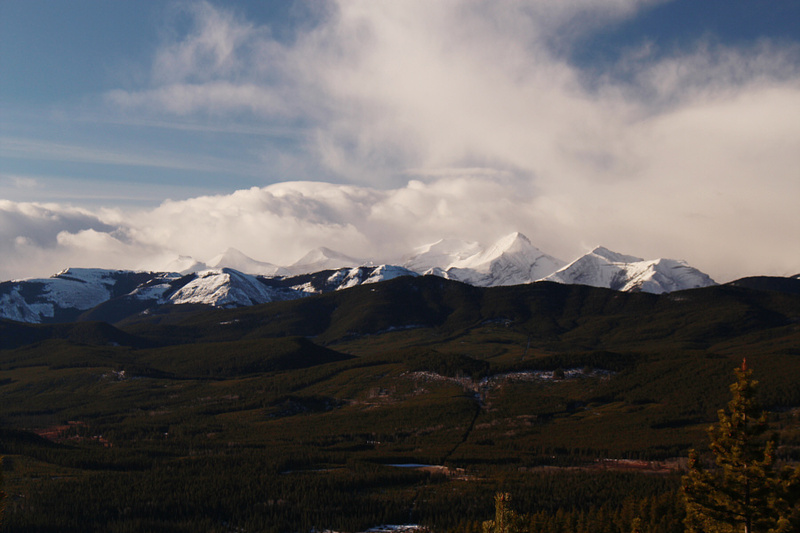 The most prominent peak to the northwest is Moose Mountain. The group leaves the summit of McLean Hill. 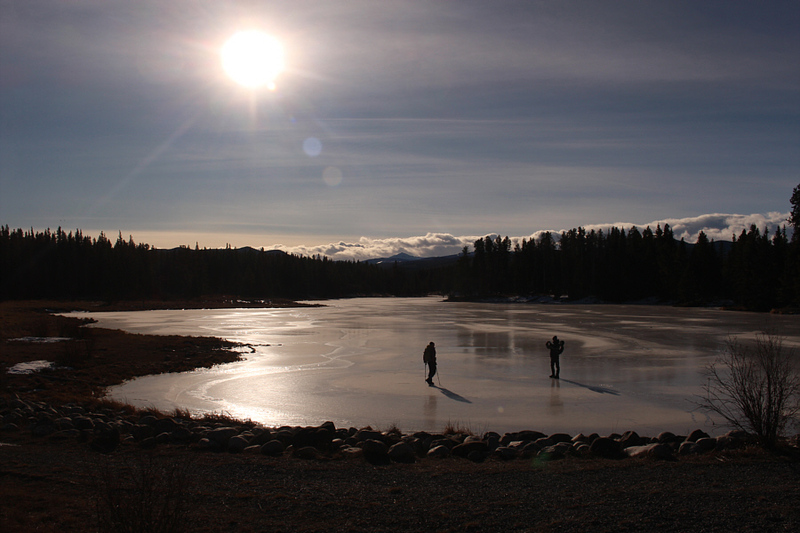 Marta and Kevin test the ice on frozen McLean Pond.